Its been years since I did any work with clay. High school in fact. And back then I didn’t think I really enjoyed sculpting. Well, I tried it again a little while ago and I LOVE it. 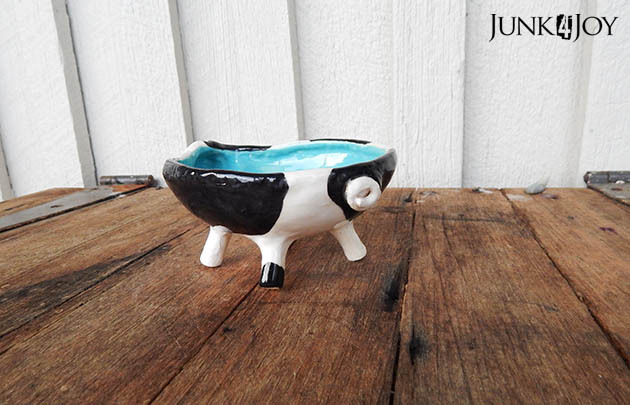 This little pig bowl was my first foray into the world of pottery. 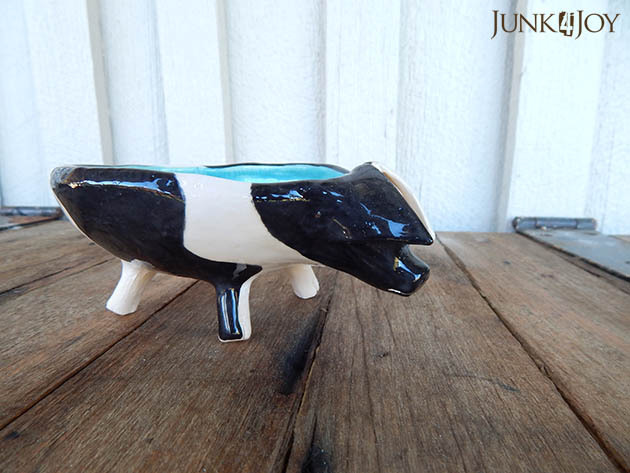 He’s called a cowpig cause that’s what a friend called him when she saw the colour. 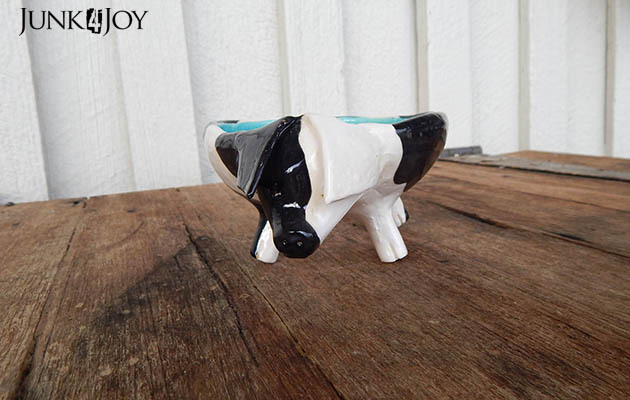 Ok, so I got the holstein patches on a pig, ok, I stuffed that up… but he’s still darn cute. I picked aqua blue for the inside cause pink would just be wrong… and disturbing… plus I love aqua.. 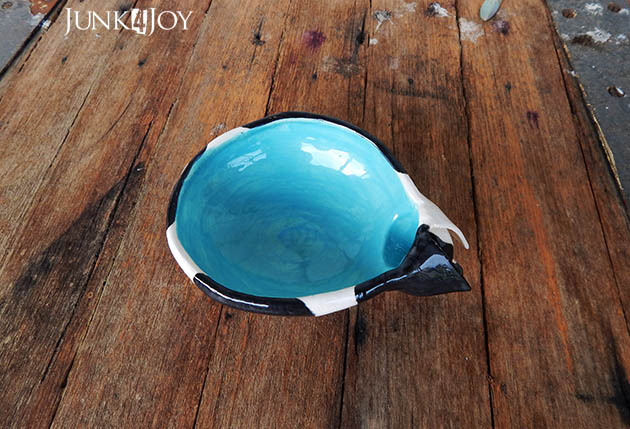 The idea is that its a little bowl I can plonk bracelets or such in. For now its sitting on the air conditioner (which is a floor model) in the living room where I can see it every time I walk past. Next I made some little critters. 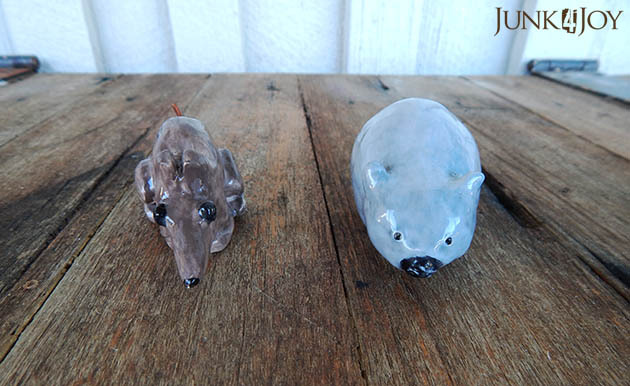 I made a chicken, two bandicoots and a wombat. The chicken is not here, neither is one of the bandicoots, but the other two are. 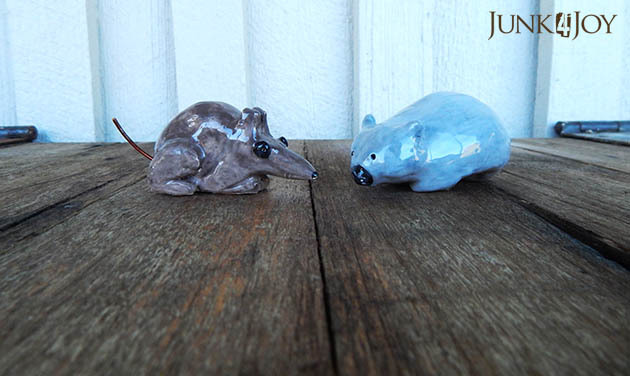 Let me introduce the brown bandicoot and the common wombat. I gave the little bandicoot a copper wire tail. I’m loving this. Both the building up and the carving out. I want to buy a slab of this paper clay and make a ton more stuff. The paper clay is clay mixed with paper pulp. It dries completely white and is easy to work with. 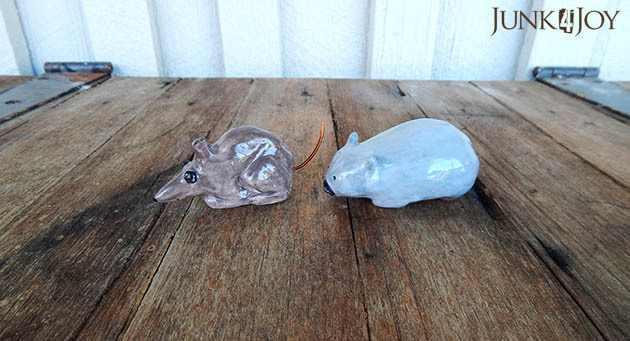 I then take it to a place in Hobart to have it fired, paint (glaze) it with the right paints and have it refired. After the huge garage sale at the end of October. After moving the grooming room to the storage room. This entry was posted in art, Craft by zefiart. Bookmark the permalink. Yes, pink on the inside of the pig would be a bit disturbing! 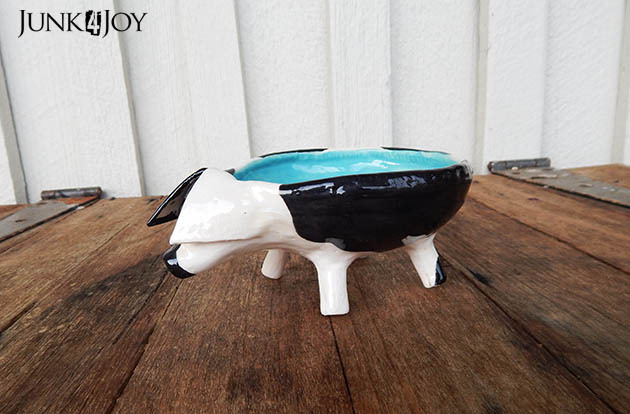 lol Love the pig bowl! I don't know a thing about bandicoots and wombats, but there are cute little critters. Love the copper wire tail! We have two “cow” kitties, or “tuxedos” depending on who is talking about it. A huge garage sale! Wow! They are work. We had one a couple of months ago with a major amount of stuff I had gone through before we moved a year ago. I was lucky to actually have a garage where I could spend time and set things up in a logical manner. It's time to get out there again, because I didn't sell any home decor. I wasn't sure what we'd want to keep, but we have been talking about colors and how we want our home to look, so I may be ready to let go of some things we've been dragging around! Besides, I had a load of stuff left. Since there are hardly any yard sales in our area, people are hungry to go to them. I hope you make lots of money and do something special for yourselves!